JAKE Hyde scored twice as Woking survived a late comeback to secure a 3-2 victory over Kempston Rovers and book their place in the next round of this year’s FA Cup. Woking raced into a commanding lead in the closing minutes of the first half, with Ian Gayle and Hyde scoring three goals in as little as seven minutes to put the hosts into a comfortable position at the break. 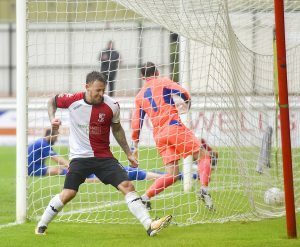 However, the Bedfordshire-based Evo-Stik League Division One Central side set-up a nervous finale, with two goals in two minutes from Josh Crawley and Shane Bush, but The Cards held out for a place in the Fourth Qualifying Round. With Woking still plagued by injury and fitness, boss Alan Dowson made two changes to the squad that drew with Torquay in the National League South the previous Saturday. Jamar Loza made his Cards’ debut on-loan from Maidstone United, and Charlie Hester-Cook was recalled from his loan-spell at neighbours Westfield. But with Dowson serving his second of a three-match touchline ban, it was left to assistant managers Martin Tyler and Ian Dyer to marshal the proceedings, while he watched from the stand.